Published: Oct. 28, 2015 at 12:29 p.m. Updated: Oct. 28, 2015 at 01:06 p.m.
Below are the Perfect Challenge picks for Week 8 from Marcas Grant, Matt Franciscovich, Alex Gelhar and myself, Matt Harmon. Exploiting the Browns on the ground is a popular move for fantasy players this year. However, Franchise thinks they'll bleed points through the air in Week 8. He takes Carson Palmer for his Perfect Challenge quarterback, and you can't argue that with all his weapons clicking on offense. The Marshawn Lynch pick is another strong one. The Cowboys front is a little soft against the run, but the Giants couldn't expose it with their four-man committee last week. Lynch started to look like himself last week against the 49ers, and could send in one or two runs for six. Those same 49ers draw a matchup with Todd Gurley, who is pushing for top-five NFL running back status in his first year. Franchise likes Calvin Johnson to have a blowup game across the pond against the NFL's leakiest secondary to wide receivers. Marcas went off the beaten path quickly with his Jarvis Landry pick at wide receiver, eschewing big names in favorable matchups. Landry finally broke his receiving touchdown drought by getting into the end zone twice on Sunday. The Patriots top corner, Malcolm Butler, is playing well this year, but it's unclear whether he'd follow Landry into the slot. The Cardinals defense will be a popular pick, as they could be staring at a showdown with Johnny Manziel. Marcas likes Tyrann Mathieu to bait the mistake-prone quarterback into a few turnovers. Tyler Eifert comes back from a bye this week, and was the No. 1 PPR tight end before taking his week off. Pittsburgh can get gashed down the middle by the position. Gelhar anchors his perfect challenge lineup with a Philip Rivers/Keenan Allen stack. Teams take the Ravens secondary to task on a weekly basis. Top corner, Jimmy Smith, isn't playing at the Pro Bowl level the team hoped he would produce at. Allen should see plenty of room to work as a crafty route runner against this secondary. Julio Jones led the NFL in targets last week, and looked healthy coming off 10 days of rest. Jones is back in our good graces as one of the top fantasy receivers on a weekly basis. The Seahawks defense get a meeting with Matt Cassel, who just chucked three interceptions to the Giants in his 2015 season debut. I was a little surprised to see I was the only one with Chris Johnson for a top running back. The veteran back is one of the few NFL starters averaging over five-yards-per-carry this season, and gets a matchup with the Browns this week. NFL teams run on the Browns more than anyone else in the league, and they give up the highest fantasy points per game figure to running backs. Odell Beckham had another quiet game with under 10 yards per catch, and is off some people's radar. While New Orleans top corner, Delvin Breaux picked up his play from the early part of the season, the Saints secondary can still be had. This could be a game where Beckham just goes nuclear. Anyway, that's how we're rolling for Week 8. We aren't in this for ourselves though. We are men of the people. We want you to use our picks to make your own perfect lineup and come away with the $1 million prize. So what are you waiting for? 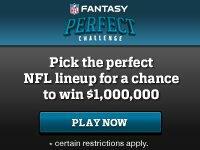 Sign up for NFL Perfect Challenge and prove that you're indeed smarter than all of us. We will gladly celebrate with you if and when you take home that grand prize. Please keep us posted.